A few months ago, my husband and I went to a fancy wedding, the type where women wear crazy sparkly dresses and heels at least 10 inches high. I, however, never wear heels (I can’t even stand in them, never mind walk) and I had no intention of paying hundreds Euros for a dress that I wouldn’t feel myself in and would probably never wear again. I looked through my closet and found one of my circle skirts (which you can see in this circle skirt tutorial) that is made out of a shiny, satiny, flowy fabric that I love but rarely wear. I had slightly elegant faux-suede sandals that matched, so I decided to sew a matching top. 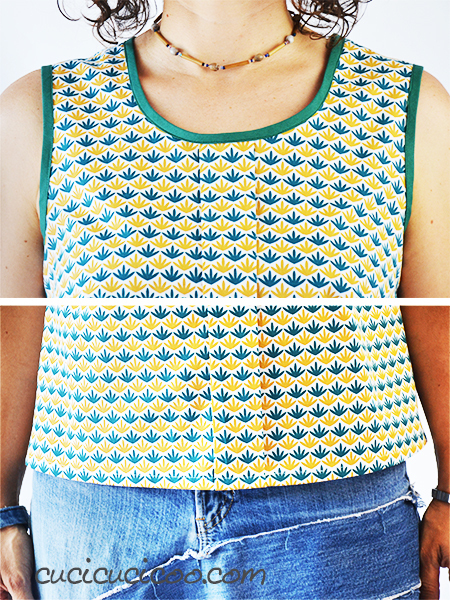 I remembered one of the first free patterns that I featured in my Newsletter, a loose tank top pattern called “Sorbetto” created by Colette Patterns. I bought a beige satin fabric to match my skirt and shoes, and I got to work. A friend gave me a heads up that the Sorbetto has fitting problems, so I first made a wearable muslin, using a light quilting weight cotton. The fit seemed fine to me, so I went with it, though in hindsight, I wish I’d gone down a size, because this size is a bit roomy on me. This is a very simple design with a loose, roomy fit so that there is no need for buttons, zippers, snaps or any other closures. The back is a simple, flat piece. 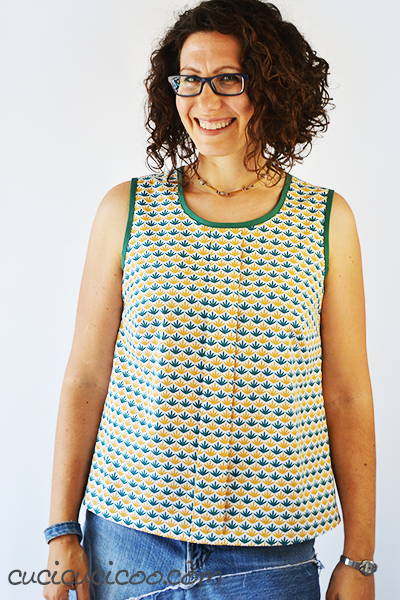 What makes the Sorbetto loose tank top pattern special is the simple box pleat going down the center front. It is an easy detail to sew, but creates a very pretty and interesting visual effect. The armholes and neckline are bound with bias binding. I used handmade bias in a solid color that matched the fabric print perfectly. 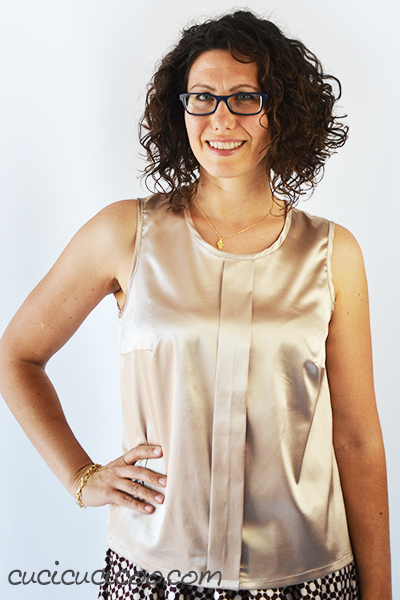 I wore my cotton Sorbetto top all summer long, and it’s super comfy. My satin Sorbetto, on the other hand, has been sitting in my closet since the wedding because I rarely dress up, but it’s good to know that it’s there ready when I need it! Notice how different the top looks in these two versions due to the different fabric drape. 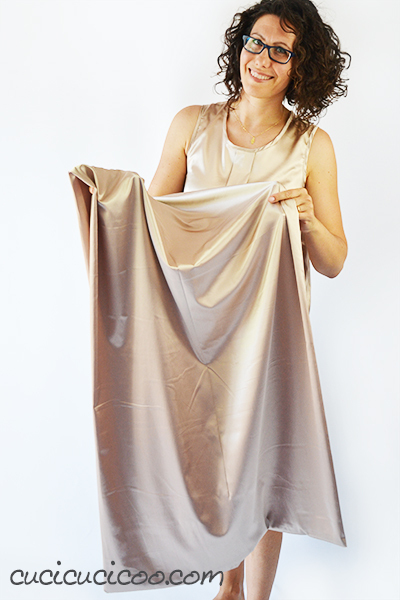 (Learn what fabric drape is here!) I love how the satin just falls down softly, as opposed to the stiff cotton. I did my best to make my own bias tape from the same satin fabric, but it was hellish, to say the least. Satin slides around, so it is hard to cut perfectly on the bias, and it does not crease, meaning that it is nearly impossible to iron into folded bias tape. After burning my fingers over and over and yelling pretty much every curse that I know, I decided to just fold the strips of fabric over the edges myself and try to make it as even as possible. It isn’t perfect, but hey, the edges are bound, and that was enough to make me happy in the end! 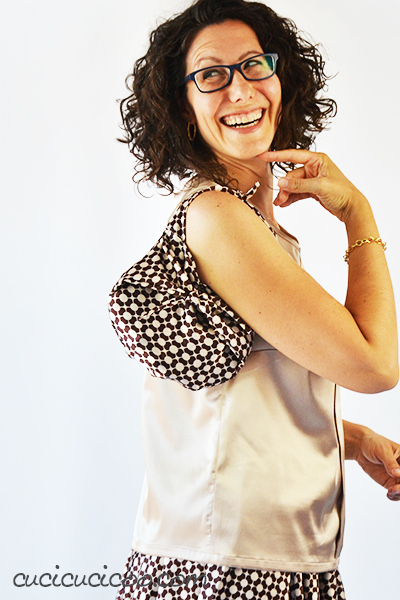 You never can depend on the weather, so I wanted to sew something simple to throw over my shoulders. 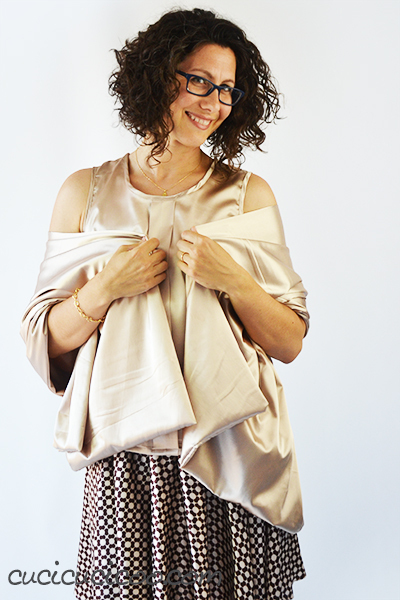 My original idea was to sew a triangular shawl with openings for my arms, but I didn’t have enough time to do that. So I made a more fancy version of the incredibly simple rectangular shawl that I sewed as a cover-up for another wedding (which you can see in this post about the flower girl dresses I sewed). I sewed a big tube from the same fabric used for the Sorbetto top, moved it around so that the seam was in the middle, not on a side, sewed the short sides closed, turned it right side out, and closed the opening with an invisible ladder stitch. It has a decent amount of volume because I didn’t topstitch around it. Very simple, but just perfect for what I needed! I realized about 20 minutes before leaving for the wedding that I didn’t have a bag that would work with this outfit. Crap!! Then I remembered the two triangular scarf accessories that I sewed from the corner scraps of this circle skirt (the instructions for which I give in the circle skirt tutorial). I quickly fiddled with them, sewed, cut, tied knots for decoration and for a strap and applied a snap, and– voilà!– I finished up my matching bag literally while my husband was waiting for me in the car. A perfect and carefree little bag for my non-conventional wedding outfit! I was so happy that I was able to sew a matching top and accessories for my original circle skirt, and could wear a handmade outfit in my own style rather than a kitschy dress from an overpriced shop. And the icing on the cake? My daughter said I looked like a goddess! You can’t get much better than that! 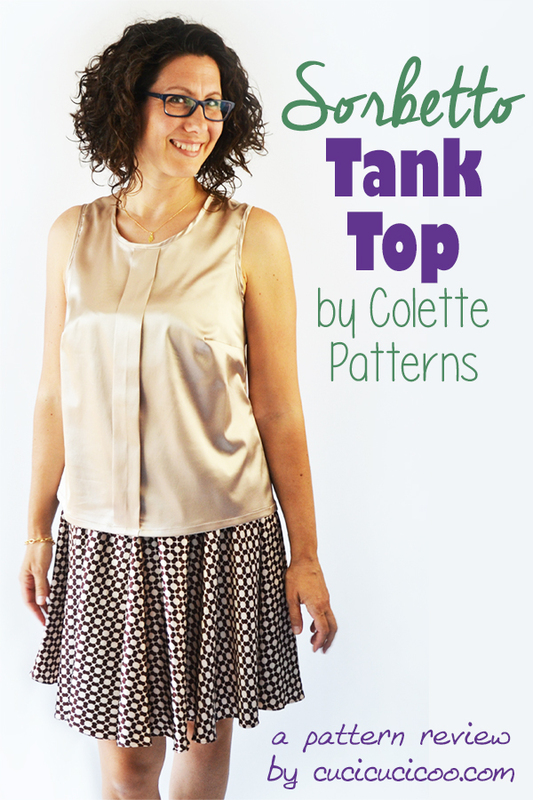 You can get the free Sorbetto loose tank top pattern at Colette Patterns and tell me what you think about it! Make sure you check out all my other posts and reviews about clothing tutorials and patterns, including the very cool Suzuran No-Waste Kimono Jacket! And, as always, don’t forget to Pin this post here to remember this pattern for later! Previous articleDIY Doll Diapers – Free Pattern + Tutorial! prima o poi avrò abbastanza coraggio (e tempo) da cucire veri e proprio capi d’abbigliamento (a parte i pantaloni del pigiama, che tanto comunque vengano vanno sempre bene). Abbi coraggio, Chiara, che ce la farai! Anch’io una volta mi sentivo di non essere capace di cucire un capo d’abbigliamento. Poi un po’ alla volta, ho fatto prima accessori, tipo sciarpe, e poi refashion, e poi vestiti veri e propri fatti da zero! è una bella soddisfazione poter indossare fiera le proprie creazioni! What an elegant outfit, definitely perfect for a wedding! I just love the drape and shine of the satin. I think Satin is a little advanced for me right now, but seeing that you’ve worked it up in cotton too, I think it is completely doable for me! And here in Florida, it is practically summer all year, so good for anytime. Thanks for sharing! Thanks, Alexandra! 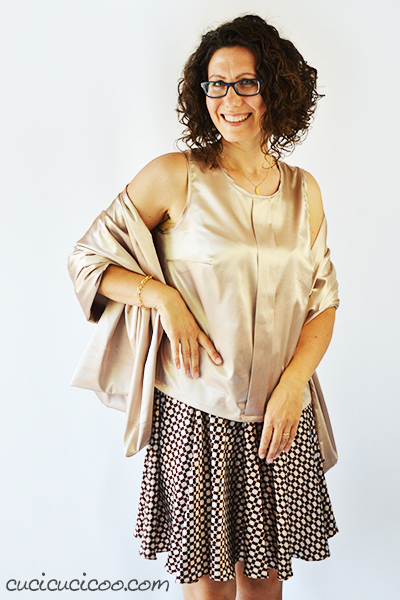 Yeah, satin is definitely not a beginner-friendly fabric. 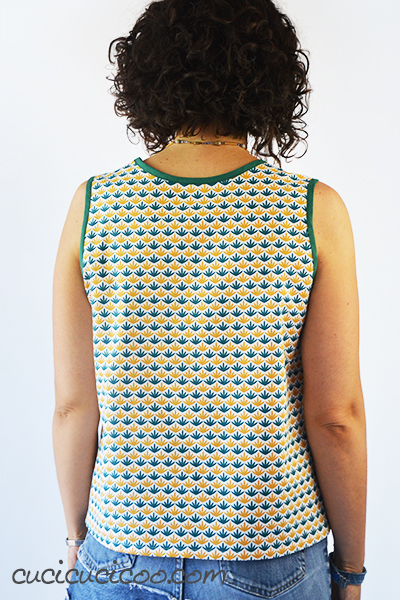 It slides everywhere and will not crease when you want it to, but this pattern in a regular cotton is really easy, as long as you know how to use bias binding! Give it a go!